Police say three people have come forward to open cases of fraud against controversial pastor Alph Lukau of the Alleluia Ministries International, after a video emerged which shows him purportedly bringing a man back to life. 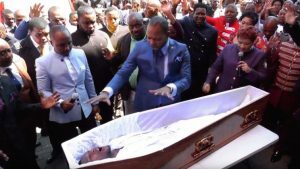 In the so-called ‘resurrection video’ which went viral last week, a man in a coffin sits up after being touched by the pastor. The Alleluia International Ministries rejects claims the man was resurrected. Police’s Mavela Masando says the fraud cases have been escalated to senior detectives for investigation. “Three people came forward. One case was opened at Bramley police station. Another case was opened at Jeppe police station and there’s also a case that was opened at Sandton police station. All those cases will be taken to the provincial office where they’ve been assigned to a senior detective that will be carrying on with the investigation. He is currently studying the statements that were given by the complainants and he will then commence with the investigation,” says Masondo. The post Cases opened against controversial pastor Alph Lukau appeared first on SABC News – Breaking news, special reports, world, business, sport coverage of all South African current events. Africa's news leader..